Only two things could make former Navy SEAL Leo Anderson return to the world of weapons and warfare. The first is a capsule of chemical weapons lost on the ocean floor. The second is a plea for assistance from the one woman he can't seem to forget - CIA Agent Olivia Mortier. Dan "The Man" Currington is back in fighting form with a mission that takes him 4,000 miles south of BKI headquarters, high in the Andes Mountains of Peru. Dan's searching for a rogue CIA agent selling classified government secrets to the highest bidder when Penni DePaul appears. Keeping Penni safe becomes Dan's priority. A lot has changed since former Secret Service Agent Penni DePaul last saw Dan. Now a civilian, she's excited about what the future might hold. But before she can grab on to that future with both hands, she has to tie up some loose ends - namely, Dan Currington, the man she just can't forget. And a secret that's going to change both their lives - if they can stay alive. I LOVED this book. It was my fave of the series, even though I love them all. I thought Snake and Shell would never be beat in my heart, but I LOVED Dan and Penni. Completely FABULOUS. I adored them so completely. Totally. I love this series anyway, meeting new characters and checking in with others from previous books. I adore that aspect. I can't wait for the next book! So I really liked this narrator. 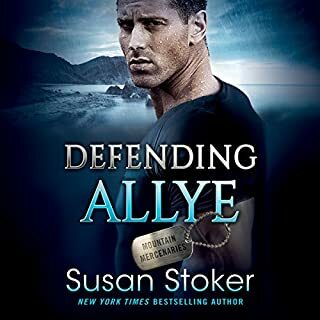 Normally, I don't like when series change narrators, and this one has done so every few books, so I've come to expect it. Some have been good, some bad. This one had a really rich voice, and I enjoyed the narration and prose. I like her accents, but the characters sounded older than I felt they should've, so I guess that's my only criticism. I would like to listen to her again, tho. Another great addition to this series! Can not wait to get my hands on the next one!! I've loved this entire series so far. I would liked to have had more story at the ending, but I guess I'll find out in the next book. Where does Too Hard to Handle rank among all the audiobooks you’ve listened to so far? Definitely ranks in my top 10. The narrator did a great job and the emotions of the books were portrayed perfectly. Loved the story. I like how the story kept going and the action was there every step of the way. Awesome story. The biggest of surprises was left to the end of the story. The lavatory scene was hilarious. They kept beating themselves up. And for those of us that have been in those lavatories knows just how small the space really is. I also liked the last scene where Peni decides to marry Dan. Oh definitely. I listen as I go to and from work daily and I was late a couple of days going into work. I'm not sure they understood that a good book that couldn't be put down was a viable condition for being late. This is an awesome story that i can listen to again, and again. Great author, great story, and awesome narrator.